The most luxurious ship ever built, Seven Seas Explorer, will enter service in royal fashion with Her Serene Highness Princess Charlene of Monaco having kindly accepted to serve as the ship’s godmother at a gala christening event in Monte Carlo on the evening of July 13, 2016. 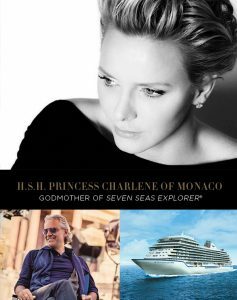 Son Altesse Sérénissime la Princesse Charlene de Monaco sera la marraine du Seven Seas Explorer. La cérémonie en tenue de soirée aura lieu le 13 juillet 2016 à Monaco avec un récital de 40 minutes par le ténor Andrea Bocelli. Born in Zimbabwe, H.S.H Princess Charlene grew up in South Africa. A competitive swimmer, She represented South Africa during various world class competitions including the 2000 Olympic Games in Sydney, Australia. She married Albert II, the Sovereign Prince of Monaco, in July 2011. They are the parents of twins born in 2014, Crown Prince Jacques and Princess Gabriella. whose mission is to teach children and adults basic water safety techniques and save lives. Drowning claims a reported 370,000 lives each year worldwide, however many cases go unreported, so the actual figure of drowning victims is sure to be higher. As a world-renowned competitive swimmer, H.S.H. Princess Charlene spent years teaching underprivileged children basic water safety techniques for aquatic environments, using the approach that simple ideas often prove to be most effective. The Foundation sponsors a number of “Learn to Swim” and “Water Safety” programs in 27 countries throughout the world, including in the United States. H.S.H. Princess Charlene recently inaugurated the first U.S. chapter of the Foundation in Los Angeles on May 10, 2016. She is also Global Ambassador of Special Olympics, the world’s largest sports organization for children and adults with intellectual disabilities. Thrilling worldwide audiences for more than 20 years, Andrea Bocelli is a renowned Italian tenor and the most successful classical solo artist of all time. He has sold more than 80 million albums of both classical and pop music, and has performed for four U.S. presidents, three Popes, the British Royal Family, the Princely family of Monaco during the Princely wedding of HSH Prince Albert to HSH Princess Charlene, several Prime Ministers and at ceremonies for the Olympic Games, Shanghai World Expo and Expo Milan 2015. “Cinema,” his most recent album and 15th studio recording, was released in 75 countries and is dedicated to movie soundtracks. His Andrea Bocelli Foundation funds programs to overcome the barriers generated by poverty, disability and social exclusion. The newest member of the Regent Seven Seas Cruises fleet, Seven Seas Explorer has been hailed as the most luxurious ship ever built. Carrying only 750 guests, it boasts one of the highest space ratios in the cruise industry and features extravagantly designed lounges and showplaces, and lavish gourmet restaurants. The all-suite ship is also home for the extravagant Regent Suite, a 3,875-square foot luxury suite with a cruise industry first in-suite spa retreat complete with unlimited complimentary spa treatments. The luxury liner’s maiden voyage is scheduled for July 20, 2016, and will spend its inaugural season in Europe before heading to Miami for a series of Caribbean voyages.